Leonard Abbeduto, the director of the University of California, Davis MIND Institute and an expert on language development, will give the 2016 Goldstick Family Lecture in the Study of Communication Disorders at the University of Illinois. CHAMPAIGN, Ill. — Leonard Abbeduto, an expert on language development in individuals with neurodevelopmental disorders, will give the annual Goldstick Family Lecture in the Study of Communication Disorders at the University of Illinois. The lecture, which is free and open to the public, will be from 4 to 5:30 p.m. on Thursday, Oct. 27 at the Beckman Institute for Advanced Science and Technology, 405 N. Mathews Ave., Urbana. 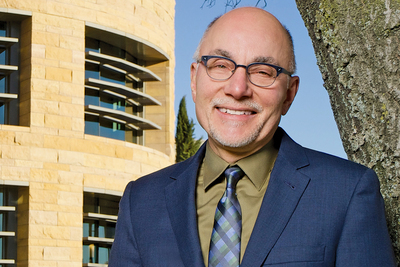 Abbeduto is the director of the University of California, Davis MIND Institute and the Tsakopoulos-Vismara Endowed Chair in the department of psychiatry and behavioral sciences, a unit within the university’s School of Medicine. Abbeduto’s current research focuses on the behavioral, biological and environmental factors that shape language development in children, adolescents and young adults with fragile X syndrome, autism or Down syndrome. He also is exploring methods for optimizing language development through parent-mediated interventions that are delivered by telehealth technology. The Goldstick Lecture series, sponsored by the department of special education in the College of Education, is made possible by an endowment from Phillip C. and Beverly Goldstick, which funds the Goldstick Initiative for the Study of Communication Disorders. The fall lecture/seminar series enables Illinois faculty members and students to share their research and brings a prominent scholar to the U. of I. campus every fall to speak about their work. The endowment also supports a sustainable training and research program in communication disorders that provides fellowships to two doctoral students whose research focuses on communication disorders and delays. Editor’s notes: For more information, contact Lisa Denson-Rives, associate director of alumni relations in the college’s Office of Advancement, at 217-300-2752; email lkdenson@illinois.edu.